© Copyright: Perry Lewis (20th October 1999). The history of Lambretta in Spain is both long and colourful. It began on the 17th June 1952 when a group of prominent Basque businessmen created "Lambretta Locomociones SA". A factory was built in Eiber (Northern Spain) in 1953 and proper production began in earnest in 1954. Production finally ceased 35 years later in 1989 (a production run 10 years longer than Innocenti). It is reported that at the Barcelona show in 1953, "Lambretta Locomociones" displayed the "D" and "LD" scooters along with the "FB" and "FC" three-wheelers. It is likely that these were actually Innocenti produced machines and that early Spanish sales were of Italian produced models. The first Spanish built Lambretta was the 125/150cc "D" in 1954 and this was quickly followed by 125/150cc "LD" models from 1955. I believe that the Spanish factory also produced a "D" model based Lambretta three-wheeler, but this was a flop. Unfortunately I know little of these early models other than the "D" models featured a unique enclosed cylinder cooling system due to overheating problems. "LD" models are essentially the same as the Italian produced version except for badging differences and the use of locally produced parts. Like all Spanish produced Lambretta's, the quality was very high due to the parent company's experience in working with metals (especially castings for guns and machine tools) and close working relations with Innocenti. Domestic sales proved very good and by 1960 production of Spanish Lambretta's had reached 50,000 units. 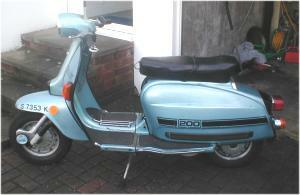 Also in 1960 production began of the "Li150" Series 2 Lambretta (followed by the "Li125" in 1962 and a "TV175" in 1963). These Lambretta's were based on the Innocenti produced versions but had a number of peculiar differences. All were fitted with the characteristic "turning" front mudguard and modified horncasting (as per the UK Rallymaster models). Basic trim and layout under the panels are the same as the Italian model, however I suspect most major components are of Spanish manufacture as I have seen no Innocenti markings on these. The Li125 also shared the same metal floor runners as its Italian cousin (the 150/175 has conventional channels and rubber inserts). The build quality of these scooters seems excellent and paint schemes include white with coloured panels/horncastings (in black, green, red, orange or blue). Quality touches include a beautifully sculptured speedometer, a dual seat as standard, tidy aluminium "LD" type legshield badges and a nice range of optional accessories. Early models feature series 1 type light switches and rear light assemblies (later models are conventional series 2). At some time in 1964, the standard series 2 headset was locally modified to take a "sixpenny" (SX/TV) type headlight (made by Forres) and series 3 style speedometer. This headset is standard on the rare TV175 series 2. Looking like the Li model (i.e. with turning mudguard), the TV175 has damper forks, a DISC BRAKE (yes this is true! ), SX style headlight, a dual seat and a (series 3 style) TV 175 engine. However this is not a "parts bin special", it is a completely unique Lambretta designed by the Spanish factory to meet the needs of the local market. This "TV" is an extremely well put together machine and it nicely illustrates the good level of co-operation between Innocenti and Spain. There is no evidence that the disc brake was ever made in Spain and so I guess they were imported from Italy. Production of series 2 Lambretta's continued well into the 60's and contrary to popular belief many were destined for export. Around this period the factory started to use the "Serveta SA" name for its increasingly commercial activities. Spain was now a major partner for Innocenti and export markets included Argentina, Brazil, Chile, Taiwan, India, Pakistan, Turkey, Philippines etc. By 1965, 100,000 Lambretta's had been produced in Spain and the factory employed over 520 staff. 1965 also saw the launch of the "Scooterlinea" (or Slimstyle) range of Lambretta's. Initially as 125/150 and 175cc models, but joined in 1966 by a 200cc version. All Spanish built series 3 Lambretta's were based on the Italian Series 3 "Li" and had the typical "Li" metal front mudguard and horncasting. All headsets however, were the TV/LIs type with a "sixpenny" headlight and chrome ring. Each model had a conventional layout under the panels (i.e. a normal airbox), grey rubber trim, floor runners and conventional looks. Again the majority of components appear to be Spanish produced. The TV175 series 3 is another rarity and I have seen only 2 examples. Very similar in appearance to the rest of the range, this TV175 had damper forks with DISC BRAKE (yet again). The main colour scheme seems to be either metallic green or light metallic blue. TV175's are very rare and were dropped a year later when the JET 200 was launched. 1966 saw the introduction of the first 200cc model in Spain, the JET 200. The very early models are identical to an Italian SX200 except for the typical "Li" metal front mudguard and horncasting. Early models have the same panels as the Italian SX200, the X200/Special badges on the legshields, a headset mounted ignition switch, SX type light switch) and damper forks (again with a DISC BRAKE!). At some point the legshield X200 & Special badges were dropped and the normal "JET 200" badge added below the "LAMBRETTA" logo. It is not known when the disc brake was dropped, but I guess it was when Innocenti got into trouble. Overall the early JET 200's are a luxurious machine (especially as they were supplied in a very nice gold metallic paint scheme). Early "disc brake" JET 200's are extremely rare (even in Spain). Also launched in 1966 was the silver metallic "150 Special". Again this model was a copy of the Innocenti version (but with the "Li" front end). In 1969, UK importers "Lambretta Concessionaires" started importing Spanish built 150 Special's alongside the Innocenti produced GP models. Eventually the JET 200 (with no disc brake) was also brought into the UK either in 1971 or 1972. There is also evidence that Spanish built Lambretta's were also being sold alongside Innocenti built machines in other world markets. After Innocenti closed, the Spanish factory soldiered on. Obviously Italian supplied parts dried up and peculiar (locally produced) parts started to appear. The SX/Special style panels were dropped in favour of "clip-on" Li items, floor runners replaced by rubber mats and the air filter moved into the toolbox (using a vented toolbox door). Also in 1973 Serveta produced a Lambretta (200cc) powered monkey-bike called the "PONY". Throughout the 1970's, Serveta struggled to revamp and update its Lambretta range. At the time the Indian SIL factory was beginning to market GP machines and domestic sales were being lost to competitors. Consequently from 1975 through to 1983 Serveta introduced many changes and launched several new versions of its 125/150 and 200cc range. Initially the JET range was updated with the introduction of chrome indicators (on stalks), upgraded electric's and GP style panel stripes. By the late 70's JET's had acquired new square (CEV) type handlebar switches, an ignition switch (behind the seat) and some had a 6V "sealed beam" type headlight. Eventually the "SERIES 80" range was launched and in general this range featured (LYNX style) fibreglass mudguard/horncasting, an ignition switch, new style locking seat, Vespa style "body-line" indicators, 6V electric's (12V Motoplat electric's on later machines), upgraded (CEV) switchgear/lights, fat front dampers and sticker type badging. My 1982 model still features the old style metal headset (with 3 warning lights) and the toolbox mounted air filter. These updates coincided with the UK scooter revival of 1979-1982 and many Spanish machines were imported into the UK. Much is made of the poor quality of these Lambretta's (especially the electric's). However when compared with the SIL manufactured GP's of the period, the Spanish Lambretta's were very good products indeed. 1983 saw the launch of the "LINCE" (or LYNX), available in 125/150 or 200cc versions. The LYNX pulled together all of the previous changes and added more. By this time Spain had joined the EEC and regulations required the use a larger (CEV supplied) headlight. Rather than produce a completely new headset, the new headlight was simply hung from an over large fibreglass shroud (mounted on a modified metal base). This and other attempts to "modernise" the styling produced a Lambretta that was not liked by many traditional UK Scooterists. Despite this a reasonably large number of LYNX Lambretta's seem to have been produced and in 1984 a police version was even made complete with lights and a siren. Early LYNX models have sticker type stripes on the panels, front mudguard and legshields. Later models simply have the word "Lambretta" (modern logo) on each panel and on the legshield. Capacity was shown via a sticker badge on the horncasting and eventually through use of a chassis plate. On LYNX models the main frame (along with forks, wheels and everything under the panels) was painted matt black. Coloured paintwork was limited to panels, legshields, headset, horncasting and front mudguard (with matching colour coded front dampers). Also the traditional Lambretta stand was dropped and a Vespa PX style one used. It is evident that the very last LYNX models were modified to take an electric starter motor (and I have heard that several production "electric start" models exist in Spain/Italy). Overall, despite the looks, the LYNX was quite an accomplished scooter. It went well, the electrics were generally good (except for the regulator) and its lighting very powerful. Unfortunately by the late 1980's the Spanish factory was in serious financial trouble. Throughout the 1950's, 60's and 70's Spain had been a protected economy and protectionism had preserved the local motorcycle industry well (whilst elsewhere in the world other more famous manufacturers had closed). This is not to say that Serveta had not diversified and during the 1970's they produced a range of lightweight motorcycles and mopeds (some under licence from Honda). However by the 1980's Spain was a member of the EEC and subject to the harsh international reality of competition and regulation (especially on exhaust emissions). 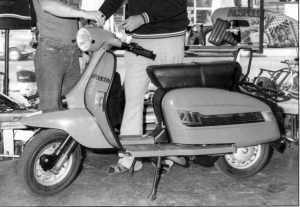 By 1982 the name Serveta was dropped and the Spanish factory started trading as "Lambretta SAL". In 1985 production was switched from Eiber to Amurrio after yet another change of ownership. Towards the end, Lambretta's were being produced alongside washing machines almost on a made to order batch basis. Ultimately the end came in 1989 or 1990 when the production of Lambretta in Spain finally ceased. In the final years Lambretta did a lot to stay afloat and several interesting "prototypes" were produced. The best known is the 1987 Lambretta "AMIGA" (or GITANA) which was an attempt to combine modern styling (allegedly) and an upgraded LYNX engine. The AMIGA boasted a 24mm "round slide" Del-Orto carburettor and a mag-housing mounted (not wise) exhaust. Prototypes (or mock-ups) were shown at Milan and appeared in the press, however it is doubtful whether a working example was ever made. Unfortunately for the AMIGA, the company ran out of money/backers before the scooter made it into production. Full production was obviously planned, as large batches of AMIGA parts were made/bought in (especially from Italy) just before the factory closed. Many thanks to my friends in Spain, Mike Dew in Cornwall and the other LCGB members who share my passion for Spanish Lambretta's. Long live Lambretta "Eiber" and "viva Serveta!". Any comments/further information greatly appreciated. Perry Lewis.